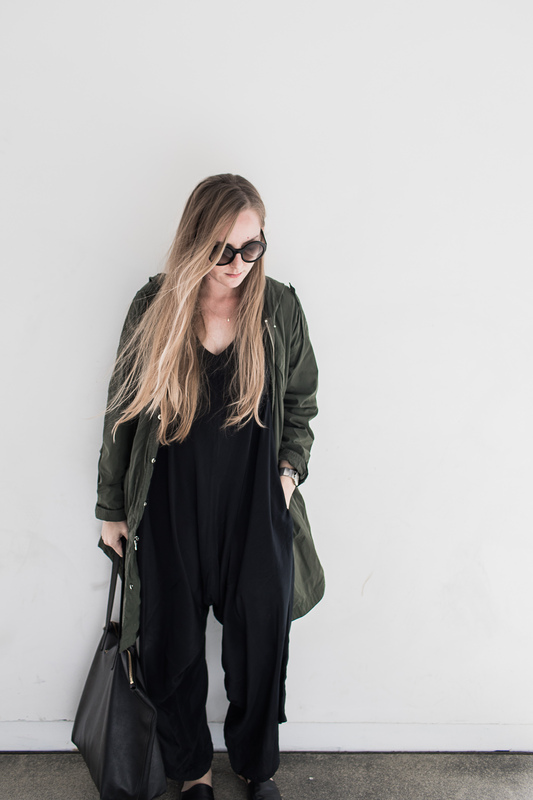 4 Ways to Wear a Black Jumpsuit - Hej Doll | Simple modern living by Jessica Doll. Do you ever find yourself reaching for that one item in your closet that you just can’t seem to get enough of? It seems the favorites come in seasons, and today I’m sharing with you four different ways that I’ve worn my favorite Summer jumpsuit. I received it as a gift from Akin & Co.
I’ve always loved the ease of silk. This jumpsuit was definitely one of my spring must-haves and I’m so happy that it transitioned so well to summer as well. Wearing Rujuta Sheth Noir Jumper (c/o Akin & Co.), Ecco Isan Pouch with Strap, Ecco Shape 35 Slide Sandal. Date nights are super easy in this jumpsuit, as it feels like a dress but is a jumpsuit and works so well to transform from day-to-night. Wearing Rujuta Sheth Noir Jumper (c/o Akin & Co.), Cuyana Crossbody Pouch, J.Crew Lanie Stacked Heel Sandals (similar by Steve Madden). I wore this outfit during my trip to San Diego for a simple night out networking with dinner and drinks. The heels I wore made it seem a bit more dressed up, which was perfect for the places we went. Wearing Rujuta Sheth Noir Jumper (c/o Akin & Co.), Zara oversized trench (similar by La Garconne), Michael Kors split pumps. I love that the addition of a simple trench and pumps can make this jumpsuit look so chic and ready-to-work for the office environment. Of course, you might not want to remove your jacket since the straps are thin, but let’s be honest here, who does that anyway? The air conditioner is always running full-speed! Use the arrows or swipe to mix up the outfit collage. Do you have a favorite item for Summer that you wear over and over again? What is it? Ok, I have to say that you rock all four ways. Whoa. I have never tried a jumpsuit. I’m built similarly to my younger sister and she wears them so I have confidence I can. I’m slim with really long hair like you, so maybe I should give it a try. My favorite look is the casual day out one. I just made the leap into my first jumpsuit, so this post is very timely! I love how flowy yours is, but I ended up with a slightly slimmer cut in jersey from Uniqlo. My boyfriend isn’t a huge fan, but I’m excited to dress it up when cooler weather hits (bonus points because it feels like I’m wearing jammies). These are all great looks! I absolutely love jumpsuits but have yet to find one that fits me perfectly! I love how this one is very flowy and light. I see so many of these at the stores now and I love the look of them. I bet they are super comfy and I would like to wear one but I am kind of unable to figure out fashion at this point. I wish I looked better in things like this but I just don’t seem to. You look super cute though! I love wearing jumpsuits! This is actually really great for tall women. You wear it so nicely! It looks so comfy and can obviously go with any accessory! It’s both sharp, classy, and can be casual all at the same time! Bet it would look great with some bright jewelry too! Oh my goodness. I just love the ways to wear this. So stylish! I haven’t worn a jumpsuit in well over 30 years. My MOm was fascinated with them at the time and kept buying them for me. They never fit me comfortably.